Classic Nashville Roadshow brings you some of the most unforgettable songs in country history just as they ought to be, just as you remember them from the radio! Remember when Johnny fell for June, and Loretta was just a coal miner's daughter? Classic Nashville Roadshow is classic country music at its finest! 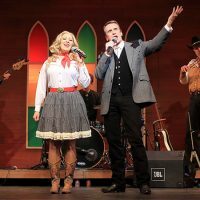 Share an evening with hits such as “He Stopped Loving Her Today,” “King of the Road,” “Momma Tried,” “Harper Valley PTA,” and “Crazy.” This full production features a live band, comedy and the stories behind the legendary performers such as Dolly Parton, Merle Haggard, Tammy Wynette, Hank Williams, and Patsy Cline. Take a journey back in time when Country was King.